Nice tee for a son-in-law who works for a Native American tribe. Good quality, good service, excellent shop to deal with. Shirt was exactly how it looks in picture. Good quality. Have washed multiple times and it's still holding up just as new! This was a gift I purchased for my stepmom! She loved it! I couldn't wait for her to open it on Easter! It's not everyday you can give someone you love very much a present that's so personal and memorable! This shirt is soooooooo soft! Very comfy and super cute. I highly recommend this store. This shipping was quite fast and it got here quick. And I just love this saying cause this is so me. Had to have it. Keep up the good work! Love it! Great quality item...exactly as ordered and shipped quickly. Thanks for such a great gift...they loved it!! I absolutely love my shirts. I love the feel and fit of them. I ordered 1 size up than I usually wear and they fit perfect. Very cute. Best rendition of this coffee themed t-shirt I have seen yet! I received this shirt today. Ordered the mens's large in gray (for reference...im a size 14/16 women, but prefer how a men or unisex tshirt falls on me versus a womens cut tshirt with curved seams), it fits perfectly and is SO SOFT! This is a must-have tshirt for anyone with coffee as their soulmate lol. My wife loves this, made for a great valentine's day gift! Love this shirt. I'm usually a size small but ordered a medium, it fits great! Love this shirt! Love how it's form fitting and long, just my style, thank you! Funny. Love it. Well done. I just received this shirt this week and I love it! So soft and comfy, and a perfect fit. I can't wait for summer to come so I can start wearing it. Thank you! I was very pleased with the quality of these shirts! Bought them for my daughter and granddaughter for xmas and they were tickled when they opened them. Shipped within a few days of ordering. Was also informed they ran small so I ordered a size larger and everything fit perfectly. Highly recommend! All fit great and the quality of the shirts are great. Thank you! Can't wait to give this to my sister tomorrow on Christmas Eve! Great quality :) I will definitely be ordering from here again!!! AWESOME!!!!! Great service and my wife LOVES her gift. Can't say enough great things. Will DEFINITELY return!!! The shirt looks and fits perfect. I love the print of the words. The gold and black looks great together. This little shirt turned out to be so cute on my grandson!! Love it! My best friend loved this onesie. Her husband loved it way more! 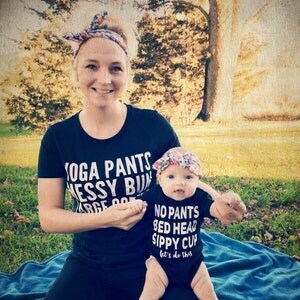 5 out of 5 stars These shirts are so adorable!!!! Such a great t-shirt. The size runs a bit small, but that was totally predictable because they are fitted so I sized up and it was perfect. Great shirt! I've received many compliments. Thank you so much for all of your help in making the exchange happen in time. Both of the shirts I bought are perfect! 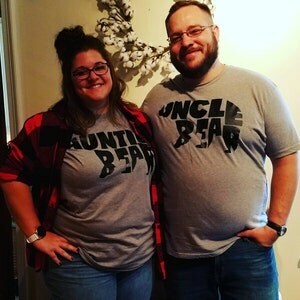 It was the perfect shirt for my twin nieces gender reveal. They are easy to work with, quick deliveries, and great with returns. Thank you!!! I love how soft the shirt is and the font is beautiful! Thank you! Being able to customize the color of shirt and graphic was fun and the quality is amazing. It shipped fast. The shirt is so comfortable.